Burger King has issued a series of marketing campaigns with chicken-characters in the leading roles. All these 'foul' campaigns have depended on elaborate, interactive web sites and viral video releases. The latest (at right) is Huckin Chicken. 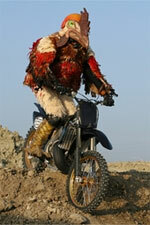 The Huckin Chicken is simply a stuntman in a chicken outfit jumping and crashing motorcycles. The ensuing videotaped mayhem uploaded to YouTube constitutes the viral campaign. The videos lead you to the Huckin Chicken web site and even a myspace page. Before the Huckin Chicken was the Buckin Chicken: Stuntmen in chicken outfits again, but this time they're being riden by cowboys at a rodeo. Here's a Buckin Chicken on YouTube. But it all began with the Subservient Chicken. A person in a chicken suit in an apartment to whom you can give commands and watch them acted out. The Subservient Chicken web site is still there and you can still tell him to dance, fall down or roll over, etc. Now you can even buy a Subservient Chicken, an 8" limited-edition vinyl one, for $65 (at right). BK also has a new non-chicken web site to help promote their new Stacker sandwiches. The www.stackersunion.com site features the 'history & traditions' of the little plastic men (at left) that make up the 'stackers union' that build the burgers. The site gives the fictitious history of the plastic men's culture, evolution and 'lifestyle.' 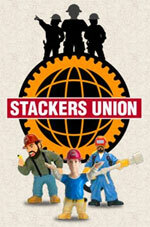 And, of couse, you can buy a set of 3 of the little Stackers Union Figurines for $14.